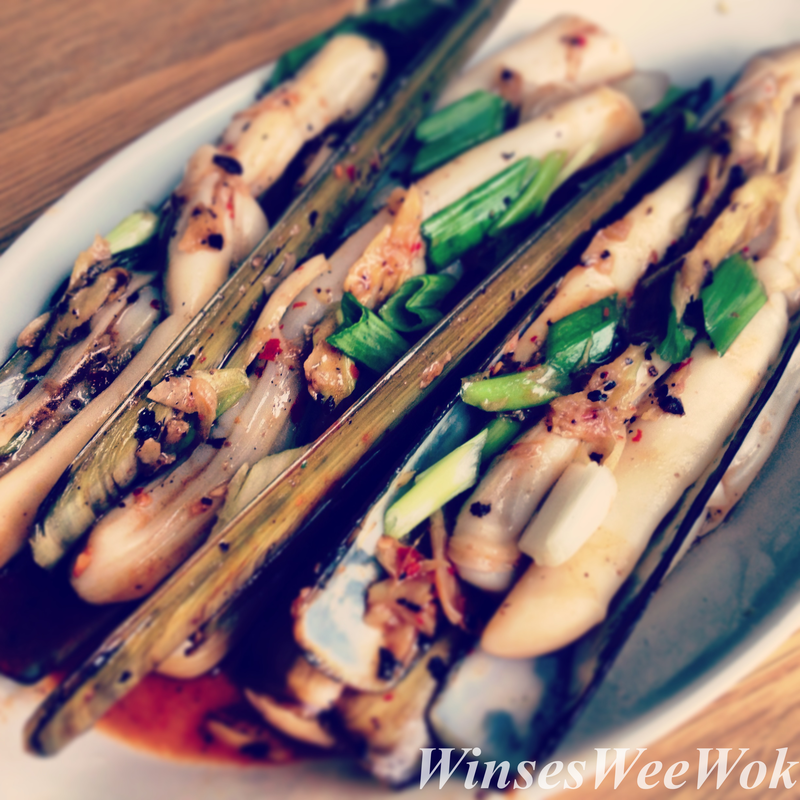 This razor clams recipe is served with a marriage of ingredients that gives it it`s unique taste of black beans, garlic, subtle chillies from the sauce, heat and aromatic ginger plus a hint of sweetness from the hoisin sauce. Mixing these ingredients together yields a sauce that goes so well with any seafood’s and especially razor clams! 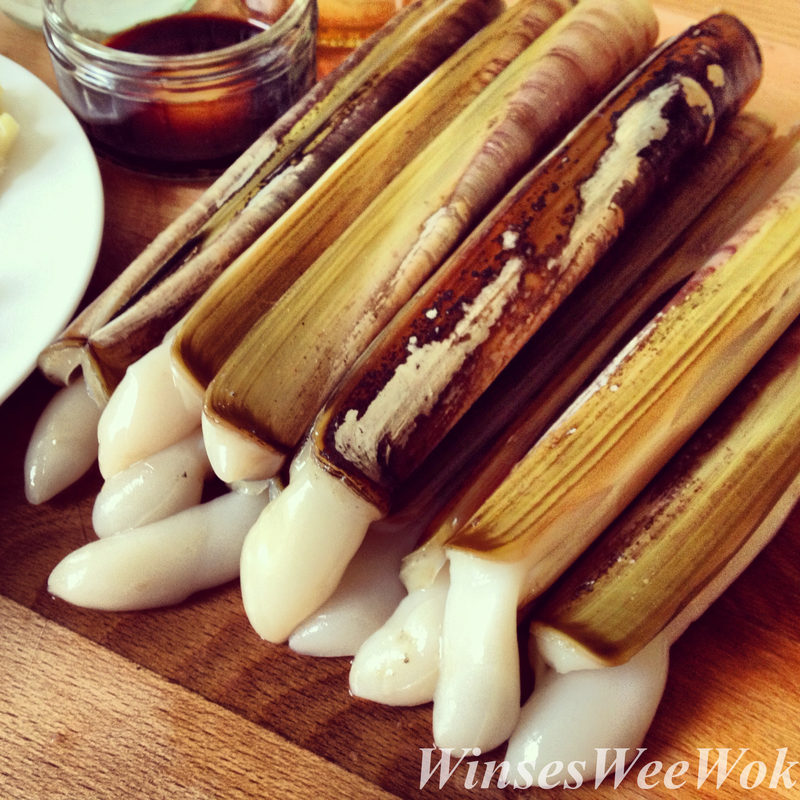 These razor clams can become rubbery in texture and can be easily over-cooked. Best to turn off the flame once they turn fully opaque. This should only take between 4 – 5 minutes. Unsure of where to get your fresh razor clams? Just visit your nearest fishmongers. They should be so fresh they are still moving. I always purchase them from See Woo Chinese Supermarkets in Glasgow! It’s worth the drive from Edinburgh but if you live in Glasgow you are in luck! See woo has the freshest seafood’s. So fresh the seafood’s are swimming and chilling in their clear glass tanks! 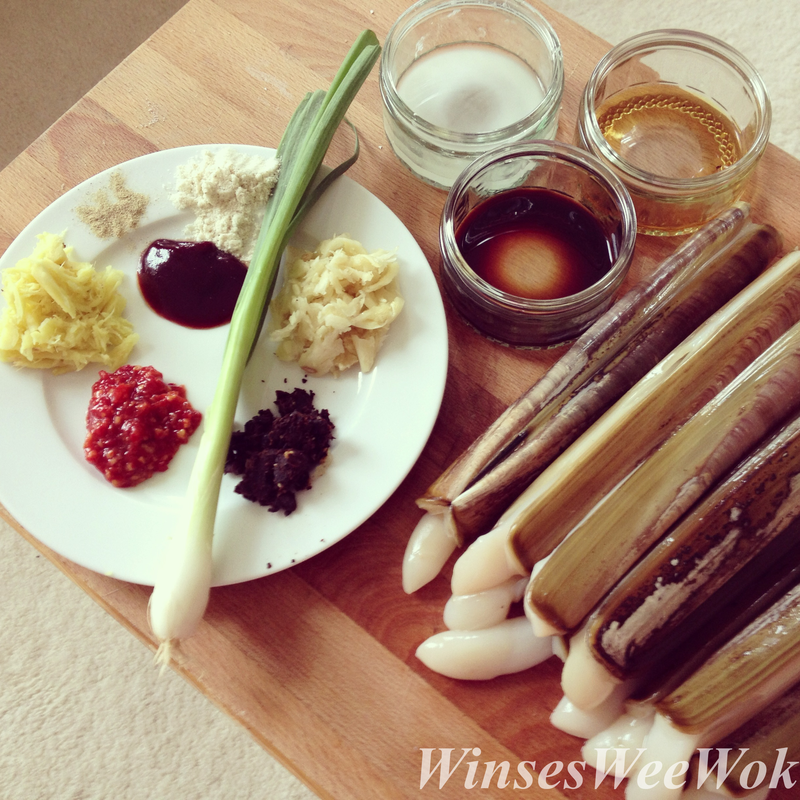 If you wish to kill razor clams humanely: – put them in the freezer for 12 minutes before cutting them. • Wash and scrub the outer shells with a brush, rinse the clams thoroughly under cold water to get rid of any sand/stones and grits. Then soak them for 5 minutes in a clean sink with a tablespoon of salt. Rinse well. This will ensure you have really clean and grit free razor clams. Place in freezer if you want to kill it humanely. • With a knife score along the clams. Cut or pull away their intestines which are the yellow part attached along the clams. Rinse well under cold water. Set aside. • Wash and chop spring onions, set aside for garnish. • Using a mortar and pesto, pound the garlic, ginger and black beans into a paste. Set aside. Mix together the hoisin sauce, chili/garlic sauce and set aside. • Heat a non-stick wok or a large metal pot on high heat, once hot, add oil. Add the mashed paste and stir fry for 10 seconds. Add water and wait till it starts to bubble. This should take less than 30 seconds. 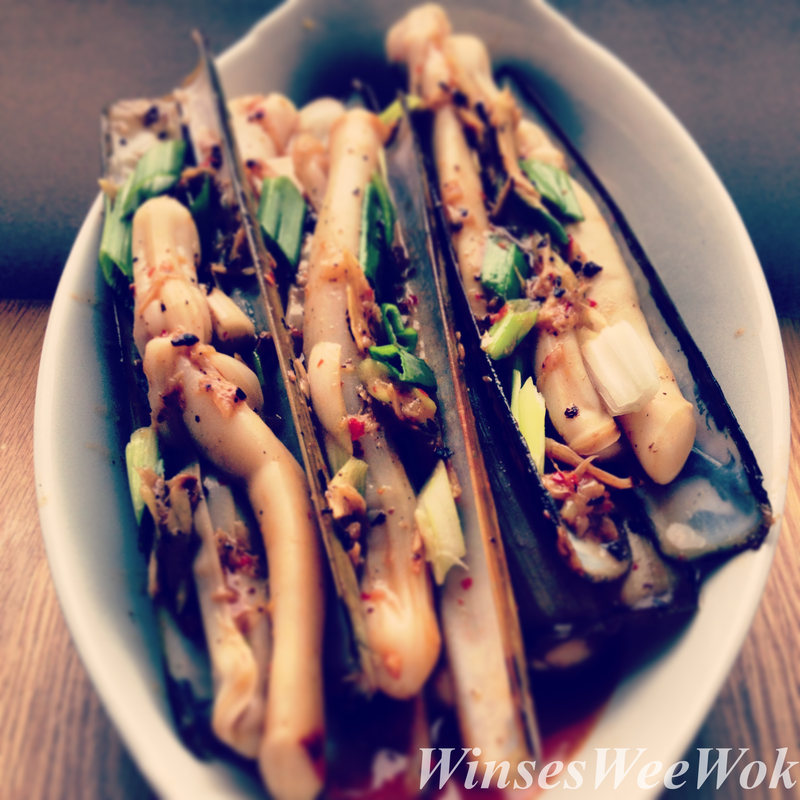 • Add in the razor clams, lid on and cook for 3-4 minutes until the meat is not so translucent and shells have started to open up. • Add the mixed sauces with the razor clams and add the thickening agent. Mix well, lid on and cook for a further 2 minutes. Mix in chopped spring onions, dish out and enjoy!